The MidWest Homes for Pets Cat Home is designed with your cat’s health in mind. The unit has several new features, which make parent cat’s life much easier as well. It easily folds for convenient travel and storage. It has four roll and lock casters for easy maneuverability and cleaning. You will find it easy moving it from one place to another notwithstanding the terrain. 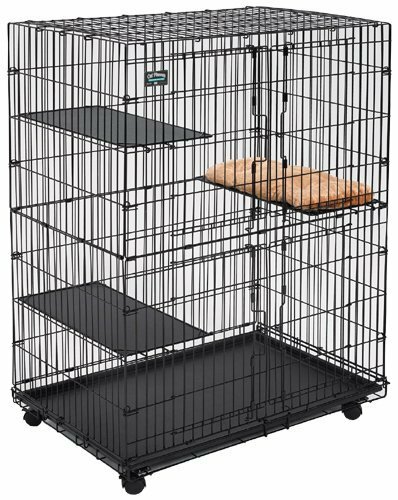 This cat playpen provides adequate room for the small kittens or large cats with several areas to play whether they are on a plastic pan or they are jumping from the three adjustable wired framed plastic resting benches or shelves. It also comes with a comfortable deluxe bed, which is securely attached to the shelf. Easy access. This is made possible with the swing-open front access double doors. The wide front access doors are located at both the bottom and top to offer maximum accessibility to feeding and for easy cleaning. Secure-lock door latches. This ensures that your pets are secure as the secure door latch opens and closes easily with a single hand. Roll and lock casters. They allow you to move easily the house around and have it locked securely in its place. MidWest Homes for Pets Cat Home is all about style and fashion. It is innovatively designed with the synthetic sheepskin and faux suede.